For everyone who loves the Romantic song literature, this is a must. (...) This is recommended with complete enthusiasm. Jorma Hynninen (...) brings great authority to this repertoire. Jorma Hynninen brings to his compatriot's songs a voice of craggy grandeur and an acute sensitivity to colour and atmosphere. 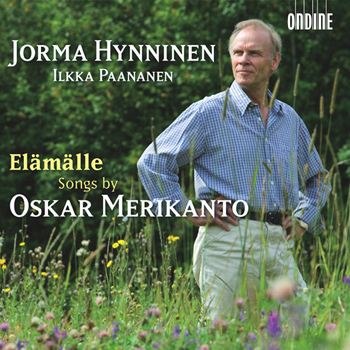 Oskar Merikanto composed himself – especially with his songs - into the hearts of Finnish people; Jorma Hynninen makes the same with his masculine, sensitive voice which has still grown richer. Jorma Hynninen is one of the most celebrated Finnish vocal artists. This disc contains the legendary baritone's very personal account of songs by his compatriot Oskar Merikanto (1868-1924). Many of the 25 songs remain to this day among the all-time favourite Finnish songs of any genre (such as the title song of this disc, Elämälle - 'To life'). During his lifetime, Oskar Merikanto was just as popular as Jean Sibelius. He was the co-founder of what would become the Finnish National Opera and composed major contributions to the song and opera repertoire: a real master of melody who incorporated elements of folk music into his works, Merikanto rightly provokes comparisons with such composers as Schubert and Mahler. Jorma Hynninen has contributed not only to a renewal in the art of interpreting solo songs but also to the creation of contemporary operas by Rautavaara and Sallinen, to name but two composers. His greatest musical love though has always been Lieder, a genre on which he successfully concentrates on this new recording. Pianist Ilkka Paananen has appeared numerous times together with Jorma Hynninen and is an equally appreciated Lied partner of Elina Garanca, Dilbèr, Matti Salminen and Gabriel Suovanen.